1963: There were 17 new fashions that came out this year. 1964: There were 28 new fashions ensembles that came out this year. Barbie's wardrobe got even more beautiful. The outfits were very glamorous. Many of the 1600 series were only issued for one year, making them some of the hardest pieces to find. 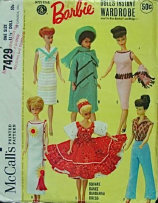 1963 Barbie's best friend Midge arrived & they shared their ensembles. Click the picture for a larger view & more Information. Click the number to see what is available for purchase!